Julie joins a small group of doctors, researchers and parents who believe there are reasons to be hopeful and interventions worth trying. Nourishing Hope for Autism is a 'must read' book for parents of children with autism and the doctors who treat them. Autism rates are increasing in the United States and abroad. Costa Mesa California-based "Talk About Curing Autism" (TACA) researchers estimate that there are over one million cases of autism in the United States alone--1 in 150 children now have the disorder. According to the U.S. Department of Health, rates of autism continue to increase more than 20 percent a year. Researchers, pediatricians and parents are working relentlessly to find the cause of, and effective treatment for, this body-brain disorder. One extremely promising area of successful intervention for these children is their diet - the foods that are prepared for them each day. Children are finding relief from the symptoms of autism as their diets are changed and essential nutrition is added. Julie Matthews, a Certified Nutrition Consultant, is a leading U.S. autism nutrition expert working with hundreds of families worldwide. She's putting recent scientific research about diet and autism to work, helping parents recover their children from autism. The results of her practice speak for themselves--parents are finding hope and children are getting better. 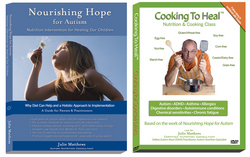 To help families heal their children and gain access to vital biomedical science and nutrition information, Julie published a groundbreaking autism diet intervention guide for parents, pediatricians and autism clinicians entitled "Nourishing Hope for Autism: Nutrition Intervention for Healing Our Children." The book stems from Julie's extensive scientific research and clinical experience--she is proving one family at a time that the symptoms of autism can improve with diet and supplement intervention. Because diet is a cornerstone of biomedical autism treatment today, implementing autism diets correctly is considered a vital first step on the path to recovery. Biomedical education seminars are emerging all over the globe, further supporting this scientific movement in the treatment of autism. Pediatricians and family doctors increasingly agree with researchers and nutritionists--the types of foods and vitamins given to children with autism matter significantly. To better support the thousands of parents that are implementing autism diets (and those just beginning), Julie has created an autism nutrition education and cooking class DVD called Cooking to Heal™. It is the first of its kind for parents cooking for children on the spectrum. The program is based on her book and years of work in autism diet research, counseling, and live autism diet cooking programs. Cooking to Heal™ provides vital nutrition education for parents who are learning about their child's impaired digestive system and how to promote healing through diet and supplementation changes. Requested by parents, the 4 hour DVD shows them how to quickly and creatively integrate special diets into their child's eating plans and provides family-favorite recipes kids love--especially for picky eaters. The Davis family, of Ontario, Canada, like hundreds of other families around the world contacted Julie for assistance with dietary intervention for their son Lucas. They believe immediate and ongoing dietary intervention is vital to their son's health and recovery. "Since changing Lucas' diet, he is sleeping better, his behavior has improved and his speech is unstoppable!! Our son is doing terrific, we see improvements each day." This story is one of hundreds of positive parent stories coming directly from Nourishing Hope, Julie Matthews' private autism nutrition practice in San Francisco. "Research indicates a powerful connection between the digestive system and the brain of children with autism," Julie says. "The association becomes evident when parents change their child's diet and notice digestion, cognitive ability, and behaviors improve." Julie has counseled hundreds of parents of children with autism from around the globe and has delivered the message to thousands worldwide. She and her clients strongly believe there is hope for recovery from autism beginning with dietary intervention as a complement to traditional medical treatment. Elizabeth Mumper, Medical Director of the Autism Research Institute recommends Julie's autism diet intervention guide to parents upon diagnosis. She states, "Nourishing Hope for Autism is full of pragmatic and helpful information for families who are eager to learn the best principles of nutrition for the optimal health of their children with autism." Jenny McCarthy, spokesperson for Generation Rescue, recently published a book entitled Mother Warriors, with real life stories of children that are recovering from autism beginning with dietary changes. Such accounts further support Julie's years of research and work in the field of autism nutrition. Lisa Lewis, Ph.D., autism diet pioneer and author of Special Diets for Special Kids notes, "Julie joins a small group of doctors, researchers and parents who believe there are reasons to be hopeful and interventions worth trying. Nourishing Hope for Autism is a 'must read' book for parents of children with autism and the doctors who treat them." Julie recommends cleaning up these children's diet and avoiding gluten and casein (wheat and dairy) because these foods can create a brain response similar to morphine, leading to foggy thinking and food cravings. Foods with artificial colors, chemicals and preservatives should be immediately removed from the diet. Next, she introduces foods that are easy to digest, rich in good bacteria, and packed with nutrients such as homemade broths, naturally fermented foods and pureed vegetables hidden in meatballs, as well as supplements such as cod liver oil, probiotics (good bacteria), calcium, magnesium, B6, and zinc. Spectrum Magazine, an autism publication reaching 60,000 parents, practitioners and educators reviewed Julie's book in November 2008. According to reviewer Kelly Nepogoda, "Families will not only appreciate Matthews' smarts and experience, they will most certainly appreciate the thought Matthews put into the guide. . . showing further inclusion of the autistic community in her work. . . . Matthews leads families through a 10 step process to 'healing the gut'. . . parents and caregivers are fully informed to make healthier moves in a healthier direction." Julie is the featured speaker on autism nutrition and dietary intervention at the world's leading biomedical autism conference, Defeat Autism Now (DAN!) and sits on the scientific advisory board of The Autism File - the preeminent treatment focused autism publication for parents and clinicians. She will be the autism diet presenter at the National Association of Autism Conference in Ft. Lauderdale, Florida on November 13-16th, which also features Dr. Andrew Wakefield, Dr. Dan Rossignol and Author David Kirby. Visit http://www.NationalAutismConference.org for NAA Conference registration information. For every family that implements diet and nutritional intervention, there is hope for one more child to find relief from autism symptoms. About Julie Matthews: Julie Matthews is a Certified Nutrition Consultant and Defeat Autism Now! (DAN!) Practitioner specializing in autism spectrum disorders. Her book, "Nourishing Hope for Autism," and her work are based in extensive research of the biochemistry of autism and the role of nutrition to restore health. She speaks at national autism conferences, leads cooking classes, writes for autism journals, and hosts a weekly radio program. Julie provides private autism nutrition consulting in San Francisco where she supports families from around the world. Book and DVD purchases and one-on-one consultations can be made at NourishingHope.com.